Finding styles you like at DutchCrafters is just the beginning. Select custom options to enhance any style to make the perfect fit for your home. 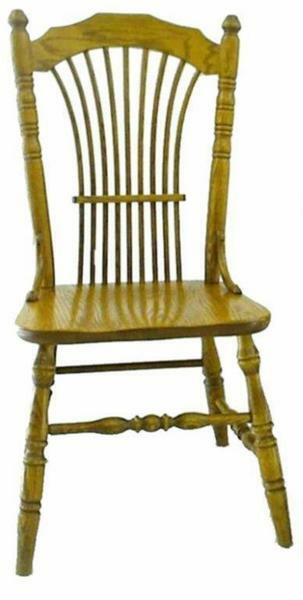 The country style Amish Furniture Wheatland Dining Chair is rich with skilled craftsmanship and a relaxed air. Country furniture exudes warmth from every angle and always presents a warm welcome in any room. Sit down to a warm breakfast at your kitchen table or celebrate together in your dining room with the Wheatland Dining Chair offering a huge dose of comfort. The Wheatland takes the slimmest spindles and bends them beautifully to represent a bundle of wheat in the chair back. Turned legs and a sculpted crown speak to dressed up country elegance for your kitchen furniture collection. I got my 4 amish chairs a few hours ago! I LOVE them!!! They are beautiful and so well made! I LOVE the way they make things-good quality craftsmanship! Thx for being there on line for us! We are very happy customers! If I had the address of the person who made them, I would send a "thank you note."